Traditional or modern, the Mexican Star Quilt is quick and easy in a planned or scrappy look. The block tricks you into thinking it is set on point! 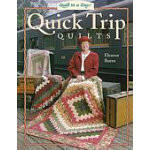 There are three different quilts with 18in blocks, and a smaller project made from three 12in blocks.